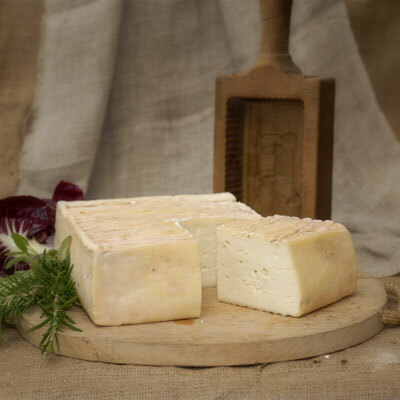 A milder, milkier, more rustic alternative to the washed-rind pungency of Taleggio, Quadrello di Bufala's distinctly gentle and sweet taste can be attributed to the buffalo milk. 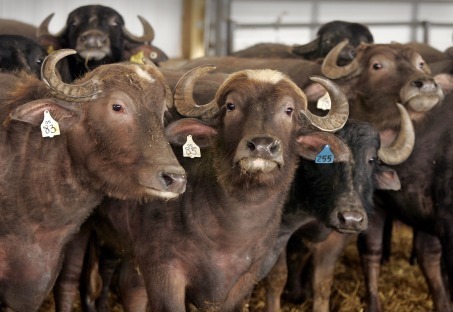 Water buffalo captured the hearts of 7th century Italian cheesemakers and continue to do so even today. And for good reason. The unusually rich and flavorful milk is high in fat and protein. Produced in the Lombardy region of Northern Italy, Caseificio Quattro Portoni, started as a cattle farm. In 2006 brothers Bruno and Alfio Gritti spent roughly six years transforming the farm into a buffalo farm, where they currently produce buffalo milk mozzarella – a cheese normally associated with Campania, a region in southern Italy. Although it's produced in the same way as notoriously pungent Taleggio (except that it's made with buffalo milk, not cow's milk), Quadrello di Bufala stands out thanks to its succulent eye-catching white paste and its clean rich flavor, which has neither acidity nor bitterness. What's revolutionary about the Gritti brothers is not so much that they produce a "southern-style cheese" in northern Italy. Rather, it's their ability to use existing styles of cheeses, like Taleggio, and substitute buffalo milk for traditional cow's milk. In this way, they're applying a "southern-style" to classic "northern" cheeses. Take a moment to appreciate this cheese's seductive aroma, a merging of cave and mushroom scents with the frank fermented smell of cultured milk. On the tongue, it is supple, creamy and coating, with plentiful salt and a vigorous tang, with a compelling fragrance, pleasing texture, flavor balance and a long finish.